Hypothesis mapping (HM) is diagramming the thinking involved in hypothesis investigation. 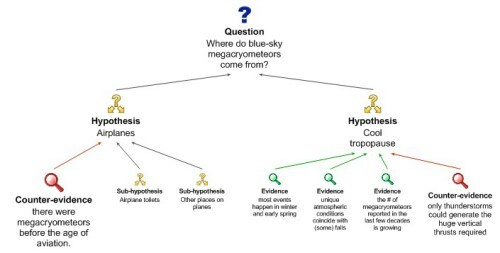 Roughly speaking, in HM we draw “box and arrows” diagrams linking our main question (e.g., “Who killed JFK?”) with hypotheses, items of evidence, supporting arguments, etc..
For a more comprehensive version of this example see Megacryometeors Original (pdf). Hypothesis investigation (HI) is determining which hypothesis is “most true” (or most likely to be true) in a given situation. It includes generating adequate hypothesis sets, hypothesis evaluation (assessing relative plausibility of hypotheses given the evidence), and hypothesis testing (determining what evidence to obtain in order to conduct proper evaluation). HM makes the thinking involved in HI visual, and is thus able to exploit the massive processing power of our visual systems. HM imposes structure on the thinking involved in HI, by requiring that information be classified and positioned on the map. HM, when done properly, imposes discipline on the HI process. There are rules or guidelines to be followed; there is expertise to be acquired. HM can be done badly or it can be done well. Doing it well requires understanding and observing the rules. Hypothesis mapping, when done competently, promises a number of advantages relative to typical, ad hoc or informal approaches to HI. Most importantly, it promises to improve one’s “hit rate” in HI, i.e. help you be more right more often in the conclusions you draw about what is going on. It also aids in making the HI process more efficient and rigorous, sharing the thinking behind HI within a team, and making conclusions more defensible and accountable. HM is a general purpose method. It can be used in just about any domain – medicine, engineering, science, business, etc. etc. However HM is particularly relevant to intelligence analysis. HM should be seen as a new addition to the intelligence analyst’s toolkit. As such, HM is an alternative to the well-known Analysis of Competing Hypotheses (ACH) method. Of course somebody might want to use both methods, HM for some problems and ACH for others, or as two different frameworks for approaching the same problem. HM and ACH have complementary strengths and weaknesses. Fundamentally, HM is based on hierarchical structure, while ACH is based on matrix or table structure. Both share the insight that bringing rigor to thinking about hypotheses requires conforming that thinking to explicit external (“outside the mind”) structures. Any given type of structure will have certain advantages, but also certain costs. The expert practitioner will be able to use the most appropriate tool for the task, with awareness and depth understanding of the strengths and weaknesses of the tool. Arguably, some of the advantages of HM over ACH – particularly its more intuitive character, and more attractive visualisation – will lead to HM displacing ACH as the default tool for HI in intelligence. HM, when done in a sophisticated fashion, involves the detailed articulation and assessment of arguments, and so draws on argument mapping. In particular, HM cannot be done with full rigor without proper appreciation of the role of co-premises in argument structures. The best way to do HM is to use software designed to support HM activities. bCisive 2 is currently the leading software for HM (as well as decision mapping and argument mapping). Austhink Consulting, which has been pioneering hypothesis mapping, provides training, facilitation and consulting services in HM.